Entertaining is our specialty! Shari loves to entertain and to see people enjoy life through friends, family, food and wine, which comes through in everything we do for your event from the simple to the elegant. 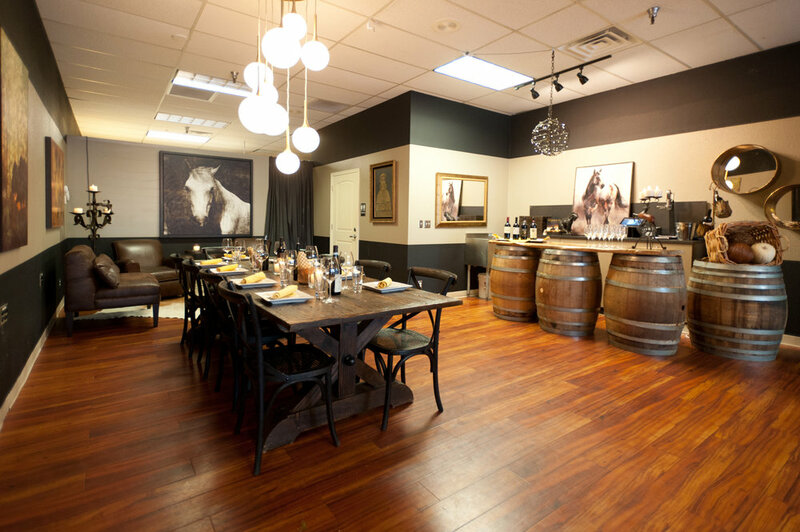 We offer a variety of private rooms and event spaces to accommodate all different sized groups for celebrations, corporate events, birthday parties, wedding rehearsal dinners, wine tastings and more! For catering inquiries of 15 people or more, please fill out the form at the bottom of this page and we will contact you with a quote and information. For parties of 14 people or less, please call us at 503-699-2927 and we can assist you with one of our smaller private dining areas and menus. If you wish to order any of our Gourmet2Go items from our deli department, please call the restaurant at 503-699-2927. Franco's Room is our new banquet room. It is the perfect location for your next corporate retreat, birthday dinner, rehearsal dinner, or any private function. This room has a western theme and is named after Nicoletta and Beppe's dear friend Franco who owns Ristorante El Comanchero in Cortona, Italy and loves Cowboys, Native American Indians and horses. It features beautiful original paintings, a rustic wooden table and overstuffed leather chairs. It has its own bar area and restroom and can be completely closed off for privacy. It holds 16-40 people for a sit down dinner and up to 75 people for standing cocktail receptions. This room is available by reservation only and has a food and beverage minimum, but no venue rental fee. Monday-Wednesday - $750 food and beverage minimum, Thursday-Saturday, Sunday - $1000 food and beverage minimum, Friday - $1250 food and beverage minimum. Our Cortona Room is a formal dining space with a rectangular wood table. It features a reproduction 1900's bakers rack and original art work depicting the main square of Cortona, home of Nicoletta and Beppe. It holds 5-12 people. There is no cost to reserve this room, but lunch or dinner must be purchased. The room is seated at 6pm or 8pm nightly. During the day, the maximum time to reserve the room is 4 hours. For longer periods, there is a $150 fee. Enjoy al fresco dining on our beautiful rustic patio surrounded by Tuscan blue rosemary, olive trees, beautiful potted plants, a gazebo, a fireplace and outdoor heaters. Our lovely outdoor courtyards are available for parties May 15-October 15th weather permitting. It is all outdoor seating and can seat 12-50 people. There is no charge to reserve your event on the courtyard, but lunch or dinner must be purchased. Due to city ordinances, the outdoor dining areas must close by 10pm. Nicoletta's Table Marketplace offers a variety of unique opportunities for customers to create an event that meet their individual needs. The marketplace has an infectious energy and it feels like being in a local Italian market. Our marketplace space features a wood fired pizza oven, a full bar, and multiple seating options. We can customize your event to include Italian wine tastings, coffee talks, cooking classes, artist lunches and live music. This area can seat 12-20 people. There is no cost to reserve the space, but lunch or dinner must be purchased. Beppe's Room is a private dining room with a rustic elegance. It features an oval table made from 100 year old elm doors and an antler chandelier. Other elements are a stone wall, painted concrete floor, leather mirror and original artwork. Beppe's Room seats up to 12 people (with a minimum of 5 people) and is located off our main dining room. There is no cost to reserve this room, but lunch or dinner must be purchased. Maximum room time is 4 hours during the day and at night there are 2 seatings - one at 5pm and one at 7pm. If you would like to reserve the room for a longer period, there is a $150 fee. We are happy to bring our delicious food to your location! Please contact our catering manager, Liane Cabot, for more details or fill out the form below for parties of 15 people or more. For Catering Inquiries For groups larger than 15 people, please fill out this form. We can't wait to help plan your party!